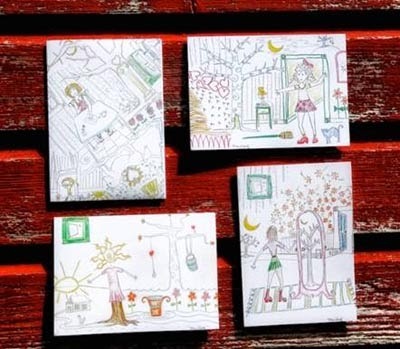 Maria Wulf is this month's Common-Thread Give-Away Artist and she will be giving away four 5" x 7" note cards featuring her artwork. To register to win all you need to do is go to her website, at Full Moon Fiber Arts and leave a comment anytime Monday to Thursday and the winner will be drawn and announced at the end of the week. Most of you know Maria, but for those who don't, I am delighted to tell you about her. She is artist, writer, wife and farm girl. Do take time to visit her website to see her artwork and quilts. She has recently visited the world's famous quilters at Gee's Bend Collective in Gee's Bend, Alabama and spent several days with these well known quilter to learn about how they create their quilts. To be sure, she had tips to share with them as well, for she is not new to quilting and fabric art. (see her May 2014 blogs). Like the famous quilts of Gee's Bend, Maria's quilts seem to flow spontaneously from what Maria envisions with the recycled materials that she has on hand. Each is unique and one-of-a-kind. Maria is also known for what she calls "streaming". This is her free-motion quilted artwork. For anyone who has not tried free-motion quilting, it is not as easy as it appears. It is machine quilting that is free flowing. The feed dogs on the machine are dropped down, so the quilt-sandwich is fed into the machine by hand and in order to sew even-sized stitches. It takes steady and even "feeding" of the fabric while at the same time guiding the fabric to make the designs to be quilted. Maria's artwork truly "streams" right out of her head and hands much like a free-flowing stream of consciousness. Designs that incorporate her thoughts and dreams and whimsy are the results. I have have tried a simpler version of what she does and with my sewing machine running, I "freeze up" trying to focus on both feeding the fabric evenly and creating the designs at the same time. It is truly a talent that requires being able to do more than one thing at a time. I laugh when I think of doing two things or more at a time, like walking and talking. I always have to stop to think. It is safe to say that Maria has no issue with doing multiple tasks at a time! I am in awe of her talents! Maria is also the wife of Jon Katz, a New York Times Best Seller author and photographer.They live on Bedlam Farm. This farm is a smaller-sized version of their previous Bedlam Farm (which is still for sale). Both are beautiful locations in up-state New York. Jon and Maria's blogs feature their life with their well-known beloved dogs, cats, chickens, sheep and donkeys and Maria is often the subject of Jon's photographs. Adorning her small stature with dresses and knee-high boots, she freely displays her love and affection for her animals and has a connection with them that is palpable, even in pictures. Her animals sense what we know of Maria: she is a gentle, loving and caring person. But make no mistake, beneath her softness is a quiet strength that is so beautifully expressed in her artwork!